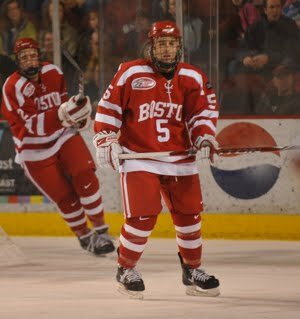 Terrier assistant captain David Warsofsky has signed a contract with the Boston Bruins and will forego his senior season at BU. The defenseman, who earned second team all Hockey East honors this season, scored 68 points during three seasons on the BU blueline. He made his pro debut last night for Bruins AHL affiliate Providence, joining former Terrier teammate Colby Cohen. Warsofsky wore #6 and had no points in the P-Bruins 4-2 win over Worcester. 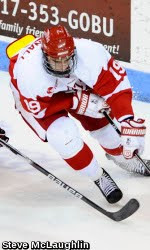 The Boston Hockey Blog has begun a series, issuing final grades to the 2010-11 Terriers. The first installment looks at the top six forwards. 2011 recruit Cason Hohmann scored his 21st goal in Cedar Rapids 4-2 win over Youngstown. He now has 48 points in 48 games for the Roughriders. 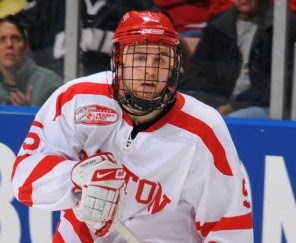 Former Terrier co-captain Nick Bonino scored a goal and two assists in Syracuse’s 6-2 win over Albany. Former Terrier blueliner Joe DiPenta was +2 for the Crunch. David Van der Gulik continues to make the score sheet for Lake Erie, tallying a goal and an assist in the Monsters’ 3-2 win over Rochester. Senior co-captain Joe Pereira has signed an amateur tryout contract with the AHL Worcester Shark. He found a few familiar faces—and fellow Terriers captains--there in John McCarthy and Sean Sullivan. Last night, he made his first start in a 5-4 overtime win in Portland in which McCarthy assisted on a game-tying goal late in the third and then scored the OT winner. Kevin Shattenkirk scored his first goal since being traded from Colorado in St. Louis’s 2-1 loss to Phoenix. Zach Cohen assisted on the game-winning goal in Lake Erie’s 2-1 win over Rochester. Dave Van der Gulik also picked up an assist. 2011 recruit Alexx Privitera was interviewed on WLCS Radio’s weekly Breaking out the Lumberjacks program (podcast). Priviterra has 32 points on the season and is tied for the lead among USHL defensemen. He was joined on the interview by his Muskegon teammate Charlie Taft, who reportedly is being recruited by BU. Taft set a franchise record for points in a game—five—last Friday with a hat trick and two assists in a 5-0 win over Cedar Rapids. Taft’s sister, Jenny, played lacrosse for BU, graduating in 2009. Terriers were ranked second in the final USCHO poll, moving up from fifth. It’s the highest final ranking for BU in program history. 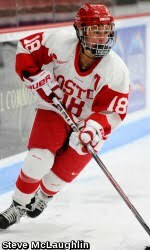 Backup goalie Braly Hiller penned her thoughts about BU’s first appearance in the Frozen Four for SouthCoastToday.com. The Terriers’ pursuit of a national championship ended one win short of the goal as BU was defeated, 4-1 by top-ranked Wisconsin in Erie, Pa. It was a one-goal game until late in the third period when the Badgers, who hadn’t lost a game since Nov. 28, added an insurance goal and an empty-netter. BU’s only score came on a slick backhand shot by freshman Marie-Philip Poulin, her 24th of the season. Goalie Kerrin Sperry stopped 32 Badger shots. 2013 recruit Brendan Collier scored the overtime game-winner for Malden Catholic in its 4-3 win over St. John’s Prep in the Mass. High School Super 8 Championship game. Nick Bonino scored his ninth goal of the season in Syracuse’s 5-2 win over Hershey. The Terrier women’s team faces its final hurdle in the quest for a national championship, meeting heavily favored Wisconsin today in Erie, Pa. The game begins at 2 p.m. ET and will be Web cast on ncaa.com. Rebounding from several losses in February when injuries impacted the BU offense, Coach Brian Durocher's Terriers are back at the top of their game in the NCAA playoffs. While BU features two strong scoring lines, the #1 ranked Badgers, playing in their fifth title game in six games, have women’s hockey’s top offense, led by Kazmaier Award winner Meghan Duggan, who scored the game-winner in Wisconsin’s 3-2 semifinal win against BC. Wisconsin’s head coach, Mark Johnson, teamed with former Terriers Mike Eruzione, Jim Craig, Jack O’Callahan and Dave Silk to lead the U.S. Olympic team to its miraculous gold medal win in 1980. Forty years ago today, the Terriers won their first national championshp, defeating Minnesota, 4-2 behind a pair of goals by All-American Steve Stirling and the goaltending of Dan Brady. We'll soon post another of our Terrier Tales features detailing BU's 28-21- season and the road to the championship game in Syracuse, N.Y.
Rick DiPietro returned to the Islanders lineup after missing six weeks with facial injuries and stopped 29 shots in New York's 4-3 shootout win over Florida. 2013 recruit Brendan Collier and his Malden Catholic teammate take on St. John’s prep in the tonight’s Massachusetts high school Super 8 championship game at TD Garden. Collier scored a goal and an assist in Friday’s 4-2 semifinal win over BC High. Combining opportunistic offense and stifling defense, Terriers defeated second-seeded Cornell in the Frozen Four semis, 4-1, and advance to the NCAA Championship game. BU will play top-ranked Wisconsin on Sunday–-exactly 40 years to the day when the Terrier men’s team won its first title, defeating Minnesota. Cornell had come into the game with a goals against average just over 1.00. After surrendering an early goal the Big Red, BU got the equalizer midway through the first from Catherine Ward. Then, in a second period heavily dominated by BU, senior Jill Kirschner (photo) and junior Jennelle Kohanchuk scored 50 seconds apart to grab a two-goal lead. Senior captain Holly Lorms added an empty net goal in the waning minutes. BU outshot Cornell 31-15, with freshman goalie Kerrin Sperry stopping 14 shots. Defenseman Kathryn Miller had a pair of assists for BU. BU is the first Hockey East team to reach the national championship game and, with a win, would become the first non-WCHA team to claim a women’s national title. David Van der Gulik, returned to Lake Erie after a short stint in Colorado and delivered three assists in a 7-2 win against Grand Rapids. John McCarthy scored the only goal for Worcester in a 4-1 loss to Providence. Freshmen Charlie Coyle was named Hockey East’s Rookie of the Year at the leagues’awards dinner on Thursday night. Coyle scored 21 points in conference games and 26 overall. He joins the list of Terriers who have won this award: Kieran Millan (2009), Brandon Yip (2006), Rick DiPietro (2000), Scott Cashman (1990) and Scott Young (1986). Juniors Kieran Millan and David Warsofsky were named second team Hockey East All-Stars while sophomore Alex Chiasson and freshman Adam Clendening received honorable mention. Coyle and Clendening were named to the Hockey East all-rookie team. 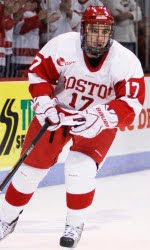 Coyle, who spent most of the season on BU’s top line, was a unanimous selection. Junior forward Chris Connolly was named a runner-up for the Len Ceglarski Sportsmanship Award and junior goalie Kieran Millan was named a runner-up for the Three Stars Award. Colin Wilson scored his 15th goal of the season (video) and added an assist in Nashville’s 4-3 overtime win over the Bruins. Jason Lawrence, top goal-scorer on BU’s 2009 National Champions, completed his season with Eindhoven in the Netherlands with 30 goals and 28 assists in 45 games. Lawrence was named to the European IJS League All-Star Team. Red Hot Hockey resurfaces at the Frozen Four as Hockey East regular season champion BU takes on Cornell at Tullio Arena in Erie Pennsylvania. An 8 p.m. ET face off is scheduled. The #3 seeded Terriers are making their first ever visit to the NCAA Frozen Four tonight, facing #2 Cornell also for the first time. Terriers' offense is led by junior Jenn Wakefield, freshman Marie-Phillip Poulin, and seniors Jill Kirchner and captain Holly Lorms. Catherine Ward and Tara Watchorn anchor the blueline, while freshman Kerrin Sperry has been rock solid in goal. Graduate student and defenseman Catherine Ward was named a second team All-American. 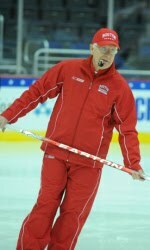 A member of the 2010 gold-medal winning Canadian Olympic team, War was third in the nation in assists among blueliners. • Hockey East Online report. Some of the biggest tournament victories in BU hockey history have taken place at the Providence Civic Center. The 1977-78 squad completed its remarkable 30-2 season there, beating BC, 5-3, in the only NCAA championship game between the two Commonwealth Avenue schools. In 1995, the Terriers won their fourth national champion at the Civic Center, thumping Minnesota, 7-3, in the seminfinal, and Maine, 6-2, in the title game. And, 25 years ago tonight, BU won its first of seven Hockey East tournament championships, drubbing the arch-rival Eagles, 9-4, with co-captain Peter Marshall’s hattrick leading the way. Blog contributor mh82 has chronicled the 1985-86 season—from a slow start to a dominant second half and post-season heroics—in another of his Terrier Tales features. For the Boston University hockey team, there was the troubling probability that history was going to repeat itself. Another season cut short. Another postseason trophy denied. Another NCAA Tournament bid rebuffed. In the inaugural Hockey East Tournament, held at the Providence Civic Center in March of 1985, the second-seeded Terriers were beaten by host and third-seeded Providence College 5-2 in the semifinal round, thereby ending BU’s season (save for a consolation game against Lowell the following day) and any ambitions the Terriers had of making a second consecutive appearance in the NCAA Tournament. Terriers dropped the deciding game in the Hockey East quarterfinals to Northeastern, 5-4 and now the continuation of their season rest with the results of other games. BU fell behind, 2-0 in the first period before Matt Nieto’s tenth of the year, on a power play, got the home team on the board. After a scoreless second period, the red light was flashing throughout the third. A Northeastern power play goal was matched by Alex Chiasson’s 14th to make it a 3-2 game, but the Huskies scored two more to stretch their lead. Justin Courtnall and Wade Megan brought the Terriers close, but they couldn’t score the equalizer. BU’s hopes to continue their season with a berth in the NCAAs are slim, but several scenarios would allow them to move on. See Scott McLaughlin’s explaination. With last night's loss to Northeastern, BU won't be able to pursue its eighth Hockey East championship, but tomorrow we can look back on the Terriers first conference championship. 25 years ago on March 15, 1986, BU completed a late-season 11-1-2 run by thumping BC, 9-4 in the championship game at Boston Garden, behind a tournament MVP performance by co-captain Peter Marshall. Blog contributor mh82 has prepared a detailed look at that season, which we'll post tomorrow. He previously documented the 1977-78 and 2008-09 seasons in articles posted on the Terrier Tales section of the blog. Terriers and Northeastern face off for the third and deciding game of their quarter final series –and their fifth matchup in nine day—tonight at Agganis Arena. Both teams are playing to extend their season. Tonight’s game will be Web cast on WZZN Radio and on the Hockey East PayPerView system. Dave Van der Gulik was recalled from Lake Erie by Colorado and had an assist in last night's Avs' 4-2 loss to Nashville. Reversing the result of last year’s NCAA quarterfinal matchup, BU defeated Mercyhurst, 4-2, at Walter Brown Arena, punching its ticket to the Frozen Four in Erie, Pennsylvania next weekend. Sophomore Jill Cardella’s deflect of a Tara Watchorn slapper midway through the third period break a 2-2 tie and proved the game winner. BU had two previous leads when it received goals in the first period from Jenn Wakefield (31st) and Marie-Philip Poulin (23rd) in the second, but each time the Lakers answered with a goal. Wakefield’s empty netter sealed the win. Goalie Kerrin Sperry turned aside 30 shots, matching her career high. Next up for the third seed Terriers is their first-ever game against the second-seeded Big Red of Cornell. BC meets top ranked Wisconsin in the other semifinal. On the brink of elimination, BU delivered a thorough and intensity filled effort to defeat Northeastern 5-2 in the second game of the best-of –three series. After surrendering an early power play goal, BU scored three times in the opening stanza on Ryan Ruikka’s (phone) wrister, a power play blast by Matt Nieto and Kevin Gilroy’s wrister off a Justin Courtnall feed, which was the eventual game-winner. NU narrowed the lead to one, but Joe Pereira added a wrap-around-and-jam goal midway through the third period as well as an empty netter—giving him a team leading 15. Kieran Millan stopped 30 of 32 shots to gain his 61st career win, one behind Sean Fields. He did pass Fields to become the new all-time save leaders with 1,058. Despite Nieto's power play goal, BU continues to struggle when up a man, going just one for ten. Draws continue to be a challenge as Northeastern won the face off battle with BU for the firth time this year. The win came on Head Coach Jack Parker’s 66th birthday. Terriers have hosted –and won--a quarterfinal series every season since Agganis Arena became their home in 2005. That year BU lost the first game to Providence and won the next two, a feat duplicated in 2007 against Vermont. BU will be looking do it again on Sunday night in the series-deciding game. 2011 recruit Cason Hohmann scored a goal and two assists in Cedar Rapids’ 5-3 win over Sioux Falls, bring his scoring total to 41 points in 41 games. Alexx Privitera registered two assists in Muskegon’s 4-1 win against the NTDP U17s. Privitera now has 30 points (10-20). 2013 recruite Adam Erne scored his tenth goal of the season as Indiana belted Chicago, 7-0. We’ve been advised that the announcement of Marc Hetnik, Jr.’s commitment for 2012 was premature. We’ll provide updates as they become available. Dave Van der Gulik’s 11th goal of the season was the game winner in Lake Erie’s 4-2 win over Hamilton. Blueliner Bryan Miller contributed a pair of assists in Alaska’s 6-1 win over Victoria. Now in his fourth season with the Aces, Miller has an 8-27-35 scoring line, second best among ECHL defensemen. Terriers make their second ever NCAA appearance and its against the same team, Mercyhurst that ended their NCAA experience last season. Terriers must win tonight to keep their season going. Enough said. BU was last eliminated in the quarterfinal in 1998. Two lineup changes: Garrett Noonan returns from his one-game suspension and rejoins Adam Clendening on the second defense pairing, while Max Nicastro and Sean Escobedo are back together on the third unit. Chris Connolly will skate with Corey Trivino and Alex Chiasson, while Matt Nieto moves up to skate with fellow freshmen Sahir Gill and Charley Coyle. Terriers have received another commitment for 2012 and for the second time in a few weeks, it is the son of a former Terrier. Catholic Memorial’s 6-1, 190 left shot defenseman Marc Hetnik, Jr., a senior co-captain for the Knight’s will arrive at BU in September 2012 following a season in the British Columbia Hockey League, probably with the Nanaimo Clippers. Current freshman Noonan, also a CM grad, followed the same path, playing a season in the BCHL with the Vernon Vipers, before entering BU. His father, Marc Hetnik, Sr., was a two-way centerman on BU’s 1978 national championship team which recorded a 30-2 record. A Muskegon Lumberjacks feature looks at how 2011 recruit Alexx Privitera overcame a mid-season dry spell to resume his strong season on the ‘Jacks’ blueline. Failure to capitalize on power play opportunities and a pair of goals that deflected off defensemen helped doom BU in last night’s 4-2 loss to Northeastern in the opening game of the Hockey East quarterfinal round. BU is faced with a must-win challenge tonight, and if successful, will face the same situation in game three on Sunday. Less than a minute after yielding a power play goal to Northeastern in the first period, Justin Courtnall (photo) shoveled home his second of the season to knot the score at one apiece. But the Huskies regained the lead late in the period and extended it to 4-1 with a pair in the second period. Terriers outshot Northeastern 15-7 in the final period – and 37-30 for the game— but their only tally was a Ryan Ruikka power play goal. BU had 16:36 in power play time and registered 19 of its shots with the man advantage, but only converted once. Playoff hockey begins tonight as the Terriers host Northeastern in a best-of-three Hockey East quarterfinal series. The teams play again tomorrow night and, if necessary, on Sunday. BU’s lineup will be bolstered by the return of assistant captain David Warsofsky (photo) who has been sidelined with a concussion. However, freshman blueliner Garrett Noonan will sit out the game with a suspension due to drawing his third game misconduct of the season in last weekend’s loss to the Huskies. Warsofsky will rejoin Ryan Ruikka on the top defensive unit, while Max Nicastro and Adam Clendening will be paired on the second unit. Sean Escobedo and Patrick MacGregor will continue as the third pairing. Northeastern will have its head coach, Greg Cronin, and assistant coach—and former BU captain—Albie O’Connell, back behind the bench following six-game suspensions. Tonight's game and all Hockey East quarterfinal games are being Web cast on the conference's pay-per-view outlet. Individual games are $7.95 each and a full package of all games is $39.95. Details. Former Terrier Rob Davies, now in his 12th year coach Curry College, led the Colonels to the Div.3 ECAC Northeast title last weekend with a 2-1 overtime win over Wentworth. Last night, Curry lost to Norwich in the opening round of the Div. 3 NCAAs. Ryan Warsofsky, brother of the Terriers’ David, is an assistant captain for Curry. Since his recent trade from Colorado to St. Louis, Kevin Shattenkirk has made an easy transition to his new surroundings, contributing two goals and eight assists and strengthening the Blues’ power play. Just after recording his 850th career win, Head Coach Jack Parker sat down with BU alum and WHDH-TV Sports Director Joe Amorosino to answer questions about his career, special players who have worn Scarlet and White, memorable games, the future outlook, issues regarding players, recruiting and rules changes, and some personal goals. Question were submitted by BU staff, alumni and several readers of and contributors to this blog. The interview was posted on BU Extra in short and long versions. Note: Due to problems with the blog interface, we were unable to embed the video interview, but the above links work just fine. Pairing and game dates/times have been announced for the Hockey East quarterfinals. For BU, the opponent is a familiar one, as they play a best of three series with the same Northeastern Huskies they played last weekend. BU and NU will play Thursday, Friday and, if necessary, Sunday. Matt Nieto, Max Nicastro and Corey Trivino made the Hockey East Online list of top performers for the past week. Trivino has scored ten points (3-7-10) in the past ten games. Friday night's win against Northeastern tied Kieran Millan with Scott Cashman for second most wins in program history. Millan is slated to make his 100th career start on Thursday when the Hockey East quarterfinals begin at Agganis Arena. The Daily Free Press analyzed the problems that led to BU's loss to Northeastern in Saturday night's final regular season game. Sophomore Wade Megan has set up a Web site to accept donations for the Kid's Cancer Buzz Off to be held in June at Gillette Stadium. The Boston Hockey Blog has announced its picks for Hockey East season awards. The Terriers, seeded third in the NCAA tournament, will host sixth seed Mercyhurst on Saturday afternoon at 3 p.m. at Walter Brown Arena. The Lakers are the team that eliminated BU from the NCAAs last year in opening round play on Mercyhurst's home ice. If the Terriers advance to the Frozen Four in Erie, Pennsylvania, they'll play the winner of the Cornell-Dartmouth quarterfinal. And that neatly sums up the Terriers’s 4-3 senior night loss to Northeastern. The defeat not only cost BU a chance to finish second in Hockey East—thanks to BC’s defeat of UNH—but also hurt the Terriers chances of an at-large berth in the NCAA tournament. BU is now tied for 16th in the Pairwise rankings and must make up ground during the Hockey East playoffs and/or get some help from other teams. BU took an early lead on Max Nicastro’s second goal of the weekend, a power play goal off a nice touch pass from Charlie Coyle. Coyle also set up BU’s second goal, also a power play score with Chris Connolly notching his tenth of the season, for a 2-1 BU lead. But the Huskies scored the next three goals, one in the final minutes of the second period and then two within a one-minute span in the final period to take a 4-2 lead. Kevin Gilroy’s second goal of the season drew the Terriers closer, but they couldn’t score the equalizer. BU played the final two periods with just five defenseman as Garrett Noonan took a game misconduct for contact to the head. Terriers also had a dismal night on faceoffs with NU holding a 48-29 advantage. Senior players Adam Kraus and Joe Pereira and managers Pat Walsh and Whitney Delorey were recognized during Senior Night ceremonies following the game with their parents also participating. BU and NU will be back at it next weekend as first –round opponents in the Hockey East playoffs. 2011 recruit Cason Hohman scored in regulation and then tallied the shoot-out game-winner as Cedar Rapids defeated Omaha, 5-4. Hohmann has an 18-23-41 line in 41 games. 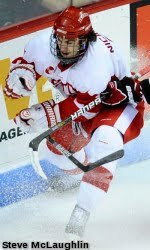 2011 recruit Alexx Privitera scored his ninth goal of the season in Muskegon's 5-2 win over Chicago. Congratulations to our former BU netminder Bob Deraney who was named Coach of the Year in the Women's Hockey East League. The opportunity to repeat as Hockey East champions went out the window as Northeastern upset the Terriers in the Hockey East semifinals, 4-2, at Walter Brown Arena. Junior Jenn Wakefield scored both goals for BU, which outshot the Huskies 44-26, but was stymied by NU goalie Florence Schelling. BU remains in third position in the pairwise rankings and will learn whether it has made the NCAA tournament field tonight when selections are announced. • Video of Rookie of the Year finalists. A shorthanded goal by freshman Sahir Gill late in the third period enabled the Terriers to edge Northeastern, 3-2 at Matthews Arena. Gill’s goal came a minute and a half after a Husky shorthander had knotted the score at two apiece. Corey Trivino’s wraparound in the first and Max Nicastro’s power play blast in the second were the other BU goals. Kieran Millan was outstanding once again, stopping 39 shots and gaining his 60th win at BU. He trails all-time leader Sean Fields by two. Freshman Matt Nieto (photo) assisted on all three goals to reach the 20 point mark on the season, the eighth Terrier to do so. The California native has ten points (2-8) in the past seven games and 15 since the beginning of second semester. The victory clinches home ice for the Terrier, who can finish anywhere from second to fourth in the conference. If BU wins tomorrow's senior night rematch against Northeastern at Agganis Arena, it will take third place, but will move up to second if BC completes a sweep of New Hampshire. BU holds the tiebreaker against the Wildcats. All playoff possibilities. Riding a nine-game (7-0-2) conference unbeaten streak, BU enters the final weekend of the regular season needing one point to secure home ice and with an upside possibility of finishing second. The latter scenario would require BU to sweep Northeastern while either BC or UNH sweeps the other. Tonight’s game, a 7 p.m. start, against the Huskies is at Matthews Arena, where the home team also has been on a hot streak in conference play with a 6-3-4 record since second semester began. Senior Wayne MacLeod, who is having an all-star type season with an 18-19-37 scoring line, leads the Huntington Hounds. BU will again be without the services of assistant captain David Warsosky, who is recovering from a concussion. He’s considered doubtful for tomorrow’s Senior Night game at Agganis Arena as well, but is expected to return for the playoffs. In the teams’ only previous matchup this season, BU took a 5-4 decision in December on Alex Chiasson’s goal with less the four minutes in regulation. Freshmen Matt Nieto and Charlie Coyle (photo) also scored in that game. USCHO’s Hockey East columnist Jim Connelly has made his all-star and awards selections. Warsofsky was named a first-team conference all-star, while Coyle and Adam Clendening are on the all-rookie team, with Coyle adding Rookie of the Year honors. Terrier Head Coach Jack Parker revealed to USCHO's Scott Weighart his top ten opposing players during his 38-year tenure at BU for the Scarlet Daily Digest. Not surprisingly, four of the ten played for the team "up the block." Heading into the final weekend of regular season conference action, BU, which still needs one point to guarantee home ice for the Hockey East playoffs, can finish anywhere from second to fifth. The Boston Hockey Blog’s Scott McLauglin breaks down all the possibilities and offers his predictions on how it will play out. Kieran Millan was named Hockey East Goalie of the Month for February after posting a 5-0-1 conference record and 5-2-1 overall. Hockeysfuture.com has rated sophomore forward Alex Chiasson as the #3 prospect for the Dalllas Stars. He was the Stars #2 draft choice in 2009. Decades before it became the advertising tag line for package delivery service reinventing itself, finding out “what Brown can do for you” was one of Coach Jack Kelley’s best experiences during a magical 1970-71 season. Bob Brown, a gangly sophomore defenseman from Scarboro, Ontario in his first varsity season, put up a 17-43-60 scoring line (in 31 games) to set a record for BU blueliners. He earned All New England, All East and All-American honors, quarterbacked a power play that clicked at a mind-boggling 40% clip, anchored a defense that held opponents to just under two goals a game and was named ECAC Rookie of the Year. 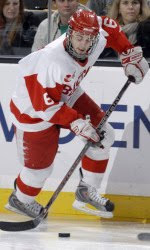 A poised and confident performer, he was paired with another hard-hitting, high scoring blueliner, Ric Jordan, to give BU the best and most prolific defensive tandem in college hockey. Oh yes, he also helped lead the Terriers to a 28-2-1 record and their first ever National Championship. A sixth round draft choice of the Montreal Canadians, Brown’s second varsity was almost a rerun of the first. Fifty points, repeating All New England, All East and All-American recognition while adding ECAC Player of the Year honors as a key cog for the 26-4-1 Terriers who became the first Eastern school to repeat as National Champions. With no freshman eligibility at the time, Brown has spent his first year at BU on the frosh team, scoring 33 points in 18 games. Over three seasons, his BU teams had a cumulative 70-8-2 record. His 79 assists in two varsity seasons ranked him sixth all-time among Terriers, at the time. Selected to be a co-captain in his senior season, Brown instead followed Kelley to the new World Hockey Association, playing two seasons in the pros. He later returned to BU and completed his degree. He was elected to the BU Athletics Hall of Fame in 1991 and this year, forty seasons after arriving with a bang on the Division I college hockey scene, Brown has received one more honor, being named to the ECAC’s all-time Top 50 performers. He joins former Terriers Rick Meagher, Vic Stanfield and Jack O'Callahan on the ECAC list, for which 40 members have been announced thus far. • Sean Sullivan scored his 12th goal of the season—league high for defensemen in AHL Worcester’s 6-2 loss to Portland. The Terriers will host the semifinals and finals of the Hockey East tournament this weekend. Top seed BU takes on Northeastern in Saturday's early game starting at Noon, followed by BC-Providence. Lots of honors for members of the women’s team. Junior Jenn Wakefield was named Hockey East Player of the Month after scoring 8 goals and 2 assists in 8 games. Marie-Philip Poulin and Kerrin Sperry were both named to the conference all rookie team. Poulin, who scored 44 points in just 24 games was a unanimous choice. Catherine Ward was named the conference’s top defenseman, captain Holly Lorms the top defensive forward and Sperry the top goalie. The Daily Free Press examines the coaching career of Brian Durocher, who launched the BU women’s program six years ago and the freshman season of Kaleigh Fratkin, who played for boys teams in British Columbia before joining the Terriers this season.